How and Where to Buy Restasis? You can buy Restasis through Canadian Pharmacy World with a valid prescription from your doctor. Our Canadian Pharmacy carries brand and generic medications at reasonable prices. For more information and further assistance, please call Customer Service at 1866-485-7979. Please follow us on Twitter and Facebook. Are there Alternative Names for the Brand and Generic Restasis? The brand name Restasis comes from Canada and India and is manufactured by Allergan. 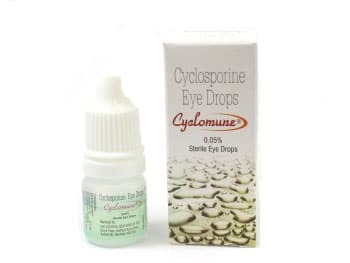 The generic Cyclosporine eye drops also called Cyclomune comes from India and is manufactured Sun Pharma. What Dosages and Forms is Restasis available in? The brand name Restasis is available in the strength of 0.05% 30 X 0.4ml vials. The generic Cyclosporine eye drops is available in the strength of 0.05%/3ml eye drops. What is Restasis used for? Restasis eye drops (Cyclosporine) are used to treat chronic dry eye that may be caused by inflammation. Restasis eye drops contain Cyclosporine which is an immunosuppressant. This medication works by increasing the tear production that has been reduced by inflammation in the eye. Restasis eye drops are dosed into single-use vials that are twice a day or as directed. What are the Possible Side Effects of Restasis? Are there any Precautions and Drug interactions for Restasis? You should not use Restasis if you are allergic to Cyclosporine or if you have any other allergies. Before you start using this medication, talk to your doctor about your medical history and about all the medications you currently take including OTC and herbal medications. This medication may cause blurred vision. You should not drive or do any activity that requires you to be alert. Restasis should not be used during pregnancy unless it is clearly needed. It is unknown if this medication passes into breast milk. Talk to your doctor before breast-feeding your baby. Restasis should be stored at room temperature between 15-25 degrees C or 59-77 degrees F away from light and moisture. This medication should not be stored in the bathroom.